Download the Vivo X23 Logo Phone wallpapers in 1080 x 2340 pixel resolution from below. There are 13 Full HD plus wallpapers inside the zip attached below. The Chinese OEM released the Vivo X23 just a few weeks ago and now it has launched Logo Phone edition of the device. Vivo X23 Logo Phone is on sale now and it does have quite a unique name. It makes sense when you consider that the Vivo X23 Logo Phone is actually just the Vivo X23 with a different Vivo Logo on the back. The Vivo logo is the highlight here, on the back of the device, hence the name, Logo Phone. The phone can be bought from Vivo online store or JD.com, but its shipping will start on October 1st. As you can see in the images above, that’s why it’s called the Vivo X23 Logo Phone. The Vivo logo is splashed across the entire back of the phone and has the same texture as the back of the phone. On the regular Vivo X23, a small Vivo logo sits near the middle of the back. It has a different texture than the back of the phone. The Vivo X23 Logo Phone features the Qualcomm Snapdragon 670 AIE processor. It delivers 35% better performance, 12% increased graphics processing and 80% power efficiency compared to the Snapdragon 660. This is paired with 8GB of RAM and 128GB of internal storage. The back of the phone houses a dual rear camera setup and an LED flash. There’s a 12-megapixel Sony IMX363 primary sensor with a f/2.0 aperture and a 12-megapixel (f/2.4) wide angle lens with a f/2.3 aperture. The front of the phone is a 6.41-inch full HD+ AMOLED display with a resolution of 1080 x 2340. The smartphone has an impressive 91.2% screen to body ratio. The display is cut into slightly by a tiny water drop notch. It houses a 12-megapixel front shooter for selfies. Both the front and the rear cameras pack AI features such as AI beauty, AI scene recognition, AR stickers and more. Connectivity options include dual 4G VoLTE, Bluetooth 5.0, Wi-Fi 802.11ac, USB-C, GPS and 3.5mm audio jack. All of this is powered by a 3400 mAh battery which is non-removable and supports 22.5W dual-engine fast charging technology. 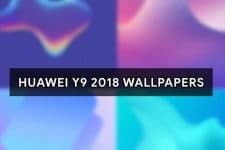 There are a total of 13 stock wallpapers ranging from simple color gradients to abstract designs, minimal landscape, and nature wallpapers. All the wallpapers have the same resolution as the Vivo X23 Logo Phone’s display, i.e. 1080 x 2340 px. The aspect ratio comes down to 19.5: 9 which is a departure from the usual 18:9 or 19:9 but then, what’s the usual aspect ratio these days anyway? So far it seems the industry hasn’t settled on a standard tall resolution since leaving 16:9 behind. The images shown below have been resized and are only meant for you to see what the wallpapers look like. Downsizing the images helps us keep the page loading time to a minimum. You can download the full-sized wallpapers from the download link provided below.